Let’s mention the fact that eyes as a literary symbol is nothing new. They can represent the “window to the soul”, which is probably what they most often represent; the Eye of God represents the omnipresent observation of the earthbound servants, possibly watching to ensure the lives being lived are lives of moral obligation; the “third eye” is, again, the eye of the soul, and a dream featuring eyes may be said to represent “true vision” or the vision of the soul. 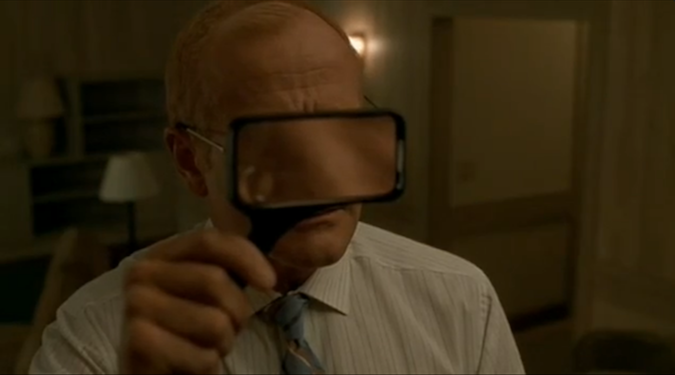 The eye symbolism of One Hour Photo can be viewed (pun) through all of these interpretations, but for the sake of simplicity let’s stick to the first one and call eyes the window to the soul. From our perspective, the distortion of the glass seems to redact Sy’s face as that of a high-profile criminal or protected witness to a crime. Our “window to the soul” plan gets pretty difficult around now, too, as Sy’s eyes (and soul) are shielded – externally by the clouded glass, internally by Sy’s careful demeanor. Sy’s point of view may very well hold his target, but we’ll come back to the fact that he observes this target first through his soul-tinted-window eyes, then through the glass of his glasses, then through the magnifying glass in his hand. This time around gets more complicated. 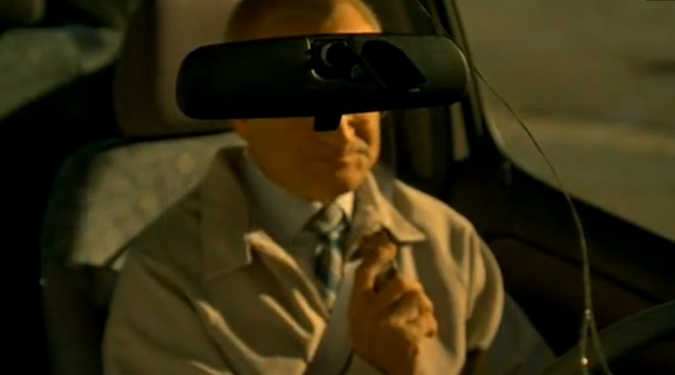 Our perspective on Sy’s soul-window is completely blocked out, and the shot is detailed enough that the front window of Sy’s car is noticeably cracked. Sy is still watching his prey, but this exact camera placement offers so many other insights: if Sy were to look straight at us, thus giving us an opportunity to gaze into his soul, he too would be met with a mirror and be forced to look back into his own eyes. These two shots (along with a few others) culminate in Sy’s terrifying dream sequence. We slowly move in on Sy as he stands alone in the white-countered SavMart. We zoom to his face and his eyes are closed. His eyes open and are red with blood, and a single red tear is followed by a torrent of dark blood spewing from both eyes. Sy screams and covers his eyes both in the dream and a moment later, when he wakes up in bed. Both Sy’s fear of someone else discovering his true nature and his own horror at having to face this nature are expressed in this sequence, as is the “third eye” or “inner eye” of the perception of Sy that extends beyond ordinary sight. This level of care is what makes One Hour Photo so rewatchable. It helps that Robin Williams is devoted to the complexities of this character in a way that only Robin Williams can be. Mark Romanek did his part to tease out a glimpse at the soul of Sy Parrish, but it was Williams who was able to make that soul into a complete portrait and a deeply affecting one.